DNA replication is a fundamental process required for the accurate and timely duplication of chromosomes. During late mitosis to G1 phase, the MCM2-7 complex is loaded onto chromatin in a manner dependent on ORC, CDC6, and Cdt1, and chromatin becomes licensed for replication. Although every eukaryotic organism shares common features in replication control, there are also some differences among species. For example, in higher eukaryotic cells including human cells, no strict sequence specificity has been observed for replication origins, unlike budding yeast or bacterial replication origins. 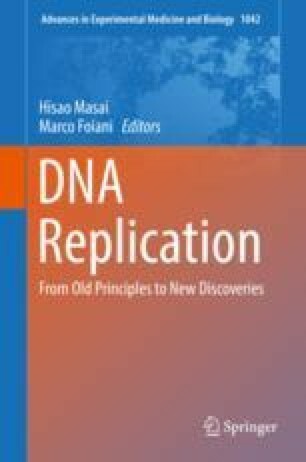 Therefore, elements other than beyond DNA sequences are important for regulating replication. For example, the stability and precise positioning of nucleosomes affects replication control. However, little is known about how nucleosome structure is regulated when replication licensing occurs. During the last decade, histone acetylation enzyme HBO1, chromatin remodeler SNF2H, and histone chaperone GRWD1 have been identified as chromatin-handling factors involved in the promotion of replication licensing. In this review, we discuss how the rearrangement of nucleosome formation by these factors affects replication licensing. We thank all members of our research group for the helpful discussion and critical reading of the manuscript. This work was supported in part by Grants to Sugimoto and Fujita from the Ministry of Education, Culture, Sports, Science and Technology of Japan (17080013, 21370084, 25291027, 26114713, 09J07233).